Is it safe for your dog to eat Pineapple? Read more to find out. Pet parents are often looking for suitable foods to treat their dogs, providing a break from the mundane dry kibble in their food bowl. Giving a dog a special snack can reward good behavior and strengthen the bond shared between pet and parent. Unfortunately, not all ‘people’ food is suitable for K-9 consumption. Certain fruits, such as mango, coconuts, papaya, and grapefruit can be good options and are generally safe for dogs in small quantities. Pineapple can be an especially good option for dogs, offering both an interesting treat with added health benefits. Pineapple is mostly sugar but also contains potassium, calcium, fructose, dietary fiber, and vitamins and minerals which can aid in boosting a dog’s immune system and improve digestive health. In some cases, veterinarians actually recommend feeding pineapple to dogs because it detours them from eating their own feces. Dogs often suffer from a weak digestive function. Feces contains undigested nutrients such as protein and, although an unpleasant ritual, dogs will engage in eating their own feces as a way to aid their digestion process. Pineapple also enhances digestive function and can help detour a dog from engaging in this activity. Pineapple cut in to small chunks is perfectly safe for dogs. Small amounts of pineapple can be beneficial to dogs and frozen pineapple can be a fun and cooling treat in the hotter summer months as well as serve as a great training treat. It is important to note that some fruit seeds can contain cyanide which is poisonous to both humans and animals. Be sure to remove any seeds prior to feeding fruit to a dog to help prevent illness. Because pineapple contains a lot of sugar, too much intake can result in stomach aches and diarrhea. As with everything, moderation is key to keeping a dog healthy and happy; a few pieces is enough. 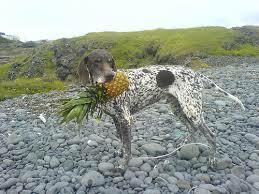 What do other dog owners have to say about whether their dogs can eat Pineapple or not? See comments below. Know if dogs can or can't eat Pineapple? Help other dog owners by leaving a comment.